Samsung is experimenting with additional features to its S Pen, the stylus that comes with the phone series Galaxy Note and is also compatible with some of their tablets. The last function that could be included seems taken directly from a film of espionage, but could also become the favorite of fans of the selfies, because it seems that Samsung wants to place a small camera in a future S Pen. The possible plan of Samsung was revealed in a patent that was granted by the Office of Patents and Trademarks united States (USPTO for its acronym in English), which shows a camera lens built into the top of a S Pen, it even has a optical zoom. The optical zoom lenses are rare in the smart phones, mainly due to the space restrictions and size of internal; but by using a system of “periscope”, it could be possible to create a zoom small enough to fit inside of a digital pen. Although it looks like something designed for James Bond in the decade of the 70’s, this may have some meaning in the present, if we link the idea with the design of the screen on our phones modern. We explain: the patent shows the S Pen only, but also includes another image in which it is seen emerging slightly from its slot in the phone. If we speculate a little, we can say that Samsung, along with many other companies, is experimenting with ways to provide a visual experience of full-screen without a notch or bezels. As Vivo, Oppo, Xiaomi and Honor have used cameras emerging, what could be the S Pen to protrude out of the body of the phone and act as the camera for selfies, allowing a future phone Note to have a full screen? For the Galaxy Note 9, Samsung added a Bluetooth connection to the S Pen, allowing it to act as a remote control for the camera on the phone, and also to interact with slide presentations, or graphics, among other features. 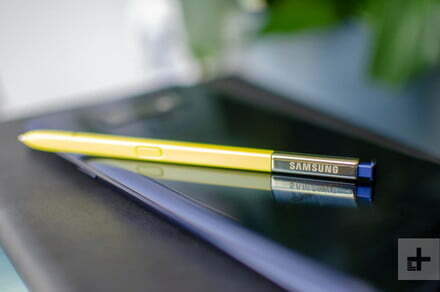 The internal battery of the pen lasts for approximately 30 minutes, so that an S Pen equipped with a camera, especially with an optical zoom function, may not have the ability to work for long time without returning to the phone for a quick charge. Will we see an S Pen equipped with a camera inside the Galaxy Note 10? Patents do not always mean that we will see these ideas set in stone, so there is no way of knowing when, or even if, this will become a real product. In addition, Samsung has also included laptops and tablets in their patent application, which was submitted in 2017 and was approved recently. For now, it is still an interesting insight into the company for the future of their line of mobile products.